A set of 12 oversized 16 X 16 in. CleanAide silver treated cleaning towels with red pinstripes - Now with ultrasonic cut meaning no surged edges on the towels, resulting in smoother and more efficient cleaning and drying. Our antimicrobial silver microfiber towels are manufactured with NOVARON, a silver-based antimicrobial agent, embedded in the fibers of the towel. This feature allows the towel to retain its antimicrobial properties through hundreds of washes, outlasting any disposables and treated cloths. Safe and extremely effective, NOVARON is EPA and FDA registered as an antimicrobial agent. These ultra soft microfiber towels will lift and trap dirt and moisture, leaving a clean, dry and polished surface. They are safe to use for hand and body drying, as well as on all surfaces around the home, car, RV, motorcycle, aircraft, or boat. 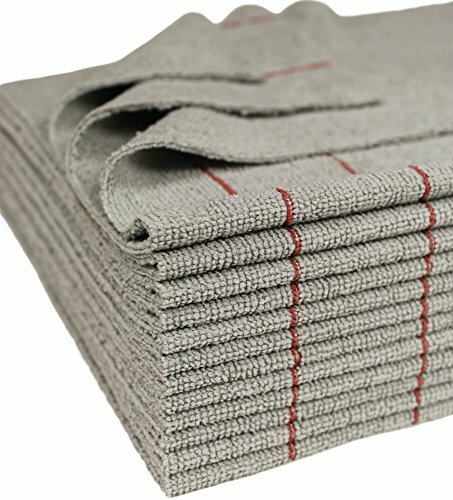 In addition, these microfiber towels are especially adept at cleaning without the use of chemicals. Use them dry, and they will work like magic without scratching, linting, or streaking. Use them wet and they will absorb seven to eight times their own weight in water. Microfiber works by attracting dust and other contaminants like a magnet and trapping them within its very fine microscopic filaments. The fibers are so tiny they are able to remove 99 percent of bacteria effortlessly just by wiping the surface. The embedded silver can now keep acting inside the towels and it will kill most bacteria over a period of 24 hours. Due to their superior quality, these microfiber towels can be washed and reused hundreds of times.Care instructions: Machine wash. Tumble dry low, and do not iron. Do not use fabric softener as this would clog the microfibers and reduce performance. Do not use chlorine bleach. Wash with other non linting materials to maintain proper dirt-gripping properties. This is a pack of 12 silver Eurow Microfiber Ultrasonic Cut Cleaning Towels with red pinstripes to avoid cross-contamination. Publisher: Eurow & O'Reilly Corp. Studio: Eurow & O'Reilly Corp. If you have any questions about this product by CleanAide, contact us by completing and submitting the form below. If you are looking for a specif part number, please include it with your message.